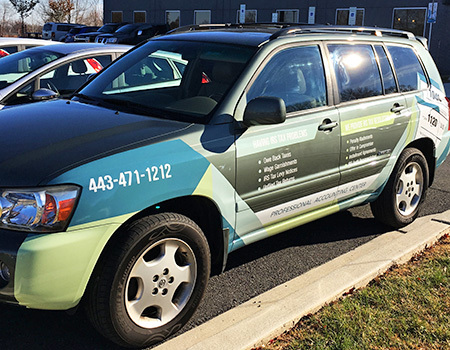 Check out our blog article on graphic design tips for vehicle wraps! 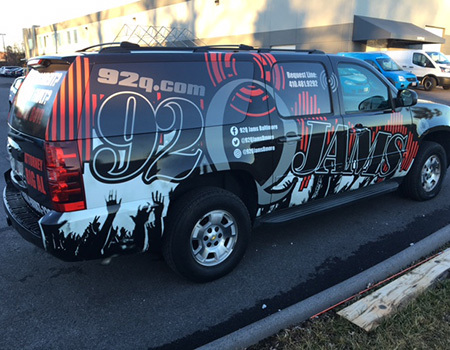 Vehicle Wraps and Graphics let your vehicle advertise for you whether parked or on the go. 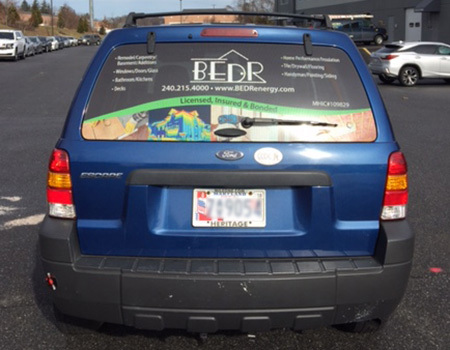 Picture your vehicle as a moving billboard that can reach further and last much longer. 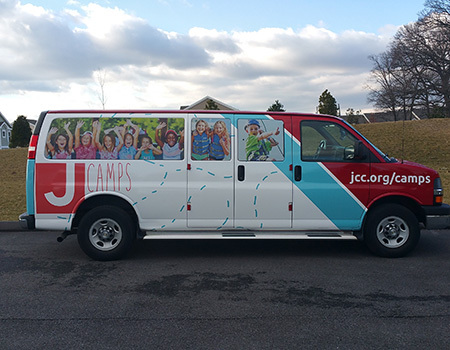 You can do a partial wrap, or consider a full vehicle wrap to maximize your campaign’s impact. We also specialize in decals. Cars, trucks, vans, trailers…if it has a surface, we can wrap it! Direct Customer Contact: Place messages in front of target consumers through coupon distribution, sampling and other promotional tactics. 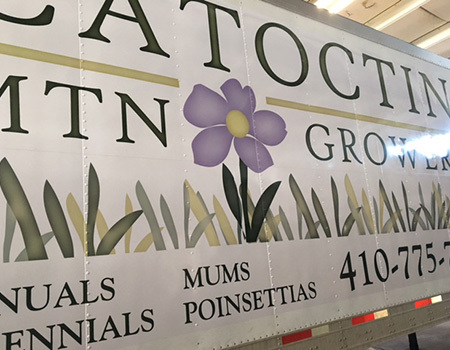 Catoctin Mountain GrowersCatoctin Mountain Growers came to us to wrap their tractor trailer! Now that's a tall order! Catoctin Mountain Growers came to us to wrap their tractor trailer! Now that's a tall order! Designed and installed by Strategic Factory. This wrap is sure to catch some attention! 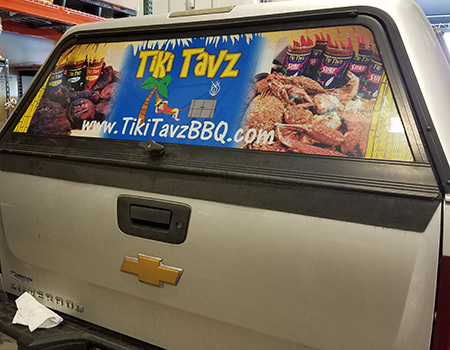 Turn your vehicle into a moving billboard and let it effortlessly advertise for you 24/7. 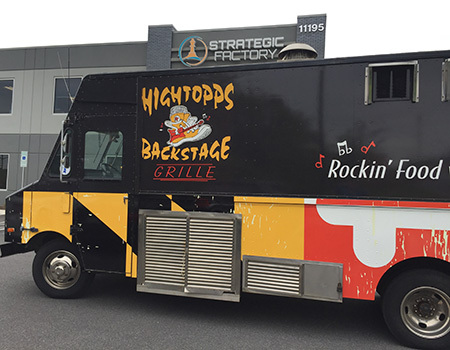 Hightopps needed to give an old food truck a face lift. Don't get a new paint job, wrap it! 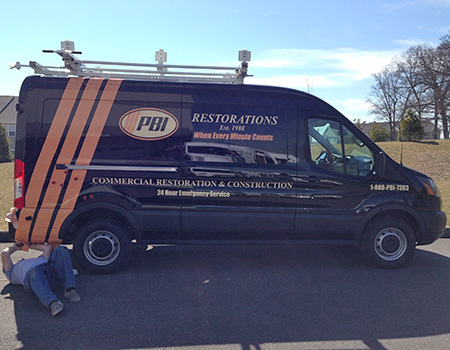 We have wrapped several vehicles for PBI. The striping on the vans is particularly cool. 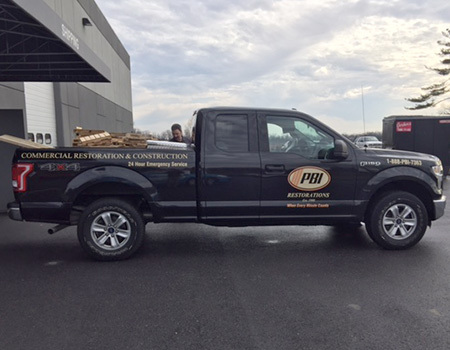 PBI trucks use consistent branding to match their vans. 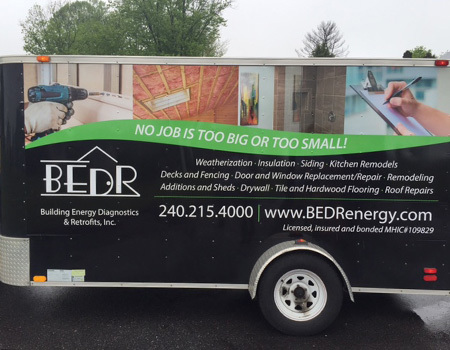 This trailer catches attention and advertises whether it's being towed or is stationary at your project site. This van was designed to match other vehicles and trailers. Even your SUV can be designed to match the rest of your fleet. This fun design not only catches attention but the window perforation adds security and shade on those sunny days! Maybe you aren't ready for a full wrap? 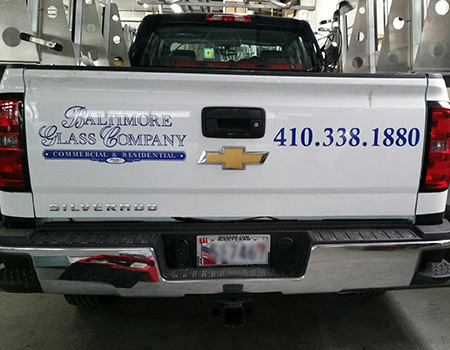 We can add your logo, phone, email and more to your doors or truck bed. Brand your windows while adding privacy and security. We can print on window perforated material allowing you to see out while others can't see in. Watch as we wrap a food truck! Elevator Wraps are great for engagement, brand messages, new products, upcoming events or conferences and more. 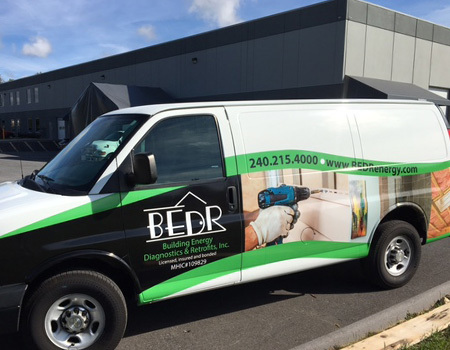 The vinyl wraps Strategic Factory designed and installed on our vehicles are absolutely amazing. After we had our van and trailer wrapped, we were so pleased with the creative design and the brand awareness we gained we have since wrapped another vehicle. Now our employees are proud to drive these vehicles around and show off our company! I would recommend Strategic Factory to anyone who needs advertising and/or marketing materials for their company. Thanks again for the excellent service provided by your delightful employees!